Just when you thought that the Australian Government’s response to climate change – the proposed emissions trading scheme (ETS) which promises to generously exempt or compensate the heavy polluters – was bad enough, it was announced today that it will also now indefinitely exclude agriculture from the ETS. The decision is purely political as was the earlier decision to exempt agriculture until 2015. All the Government is doing is appeasing the Opposition so that it can get the legislation through the Senate. The Opposition recently revealed that the majority of their parliamentarians deny there is a climate change problem. Why would you want to trade concessions with them? But the fundamental problem lies in the fact that the neo-liberal market-based paradigm is a totally unsuitable framework for dealing with climate change. In this blog – Its all a matter of construction – I pointed to a recent article – The missing link in the Garnaut report – which attacked the proposed ETS on the grounds that “the real climate change culprit is methane gas from cows and sheep”. The authors argue that Garnaut (who authored the climate change report for the Government) seriously miscalculated the impact on methane emissions relative to say, coal. The authors conclude that we should significantly cut back on farm animal production. Instead, the government was initially proposing to exclude farming from the ETS until at least 2015. But today we learn that farmers will be exempt altogether from the ETS and even allow farmers to generate carbon credits (for sale) to other big polluters. It just gets more nonsensical by the day. The next step will be that the Government will start giving even more generous concessions and further compensation to other heavy polluting industries. End result: no significant climate change response but some very rich companies, lawyers and financial market traders. For some odd reason the Government wants to have the legislation passed – no matter how flawed it turns out to be – so that it can posture at the upcoming United Nations Climate Conference COP15, in Copenhagen. While I do not support the Opposition policy position (or lack of position) on this issue, I also am a severe critic of the ETS-obsession of the federal government. The domestic decision comes on the same day as the ABC reported that the APEC leaders dilute carbon targets. APEC nations together “emit 60 per cent of greenhouse gas pollution” and had a “emissions reduction target of 50 per cent” in the draft leader’s statement. However that has been watered down and is now “likely to call for ‘substantial’ emissions cuts” only. So what will come out of Copenhagen is also likely to disappoint despite some encouraging statements (also today) from France and Brazil. I have resisted commenting much on the climate change issue because I have been focused on other research issues and have a number of impending deadlines for delivery of manuscripts and final reports etc. But I have been accumulating little notes and so this blog is a reflection on them so far. It is not meant to be my definitive statement – yet. Last week I mentioned that I was one of the presenters on the special ABC Radio National Saturday Extra forum on the future for Australian coal, which was broadcast to air yesterday. You can find a short film extract (13 odd minutes) from the Forum HERE and you can listen to the full 35 minute segment that they created from a meeting which lasted around 90 minutes HERE. They created a Youtube version of the video which I have embedded at the end of this post for your convenience – it is in two parts (to fit Youtube’s maximum 10 minute restriction). As an aside, the guy scratching his neck in the opening frame of Part 2 is Ben who plays a very mean saxophone in the swing blues band I am also in called The Blues Box. My input to the forum was as an antagonist to the mainstream views being presented by the Greg Combet, who is the Federal lower house member for the seat of Charlton (a local coal-intensive region near Newcastle) and also the Minister Assisting the Climate Change Minister Minister for Defence Personnel, Materiel and Science. He was supported by Tony Maher, the General President CFMEU, the main union exposed to the coal industry and Richard McIndoe, the Managing Director of an electricity company which owns the major Yallourn power station in Victoria (heavily reliant on lignite coal as an energy source). The other presenter/panel member was Paul Gilding, who is a consultant and is well-versed in the science of climate change and considers immediate action is required to stop coal pollution. I was sympathetic to his perspective. I made the point that the coal industry, despite its massive self-promotion is not that important as a contributor to GDP or employment. It provides less than 3 per cent of GDP (probably closer to 2 per cent) and around 0.3 per cent of direct employment. While they always claim the multipliers are something like 1 to 4 and that is what Garnaut used in his report, our own research, finds it to be below 2 and closer to 1. So it is unlikely that the total employment footprint of coal is more than 1 per cent of total employment. This was met with some disbelief by the ABC presenter (Geraldine Doogue) but the facts are the facts and just show how successful the on-going media onslaught by the coal industry has been. I noted that the two stimulus packages since December which have been the Federal Government’s response to the global downturn have been greater in terms of income generation (per cent of GDP) than the entire contribution of the coal industry. The Mid-year Economic and Fiscal Outlook 2009-10 estimates that impact to be around 4.7 per cent. But the problem for Australia, due to our unwillingness to look forward, is that we depend on coal for 80 per cent of our electricity generation. That is the problem that has to be immediately addressed. More about which later on in the blog. I also made the point that the coal industry had conned everyone into believing that clean coal (carbon capture and storage) will save the day. But as Al Gore notes “clean coal is like saying you can have healthy cigarettes”. While the Australian Government has handed out over $A2 billion dollars to investigate clean coal solutions, even its own Global CCS Institute has provided calculation which suggest it would not be commercially viable until carbon reaches a price of around $A60 a tonne, with integrated gasification combined cycle feasibly starting at A$80 a tonne. Further, the Australian Treasury’s estimates that were done for the ETS proposal suggest that carbon prices will reach $A80 a tonne (in real terms) by 2038. By then CCS will be irrelevant and the damage will have been done if the overwhelming evidence that we can draw from the scientific experts is correct. By 2030, we can be totally reliant on renewable energy for base-load power. The coal lobby trots out some fair dinkum-looking blokes in its TV commercials, but that’s advertising. The Australian Coal Association, which hopes to blunt the Federal Government’s proposed emissions trading scheme with the ad campaign, is not being fair dinkum with the public, either about what the carbon pollution reduction scheme will do to its business, or what the industry is doing to cut greenhouse gas emissions by investing in so-called clean coal technologies. It is impossible to reconcile the association’s doom and gloom with record planned investment in new coal mines and export infrastructure, and expectations that our exports of thermal and metallurgical coal are set to double, rising in volume and price. Its claims that 9000 direct and indirect jobs will be lost if the carbon pollution reduction scheme goes ahead as proposed, and that up to 16 mines will close, are contentious to say the least. Further, the coal companies will also profit because they have subsidiaries which can turn the “waste coal mine methane into energy”. The article, however says that with new discoveries of gas in Queensland, coal’s days are numbered as a major input into power generation. While most of the Coal Forum was concentrating on the market-based ETS, I introduced the alternative method of dealing with the coal issue (and pollution in general) – rules-based regulation. The fundamental issue is whether you want a market-based solution or rules-based regulation to curb emissions. This distinction – choice – is not central in the public debate because of the dominance of the neo-liberal ideology. Even The Greens are not advancing rules-based regulation in any coherent way. The important point is that carbon trading schemes (CTS) are neo-liberal constructs which start with the presumption that a free market is the best way to organise allocation. The Australian Government’s ETS fits into this box. They recognise market-failure – that is negative externalities arising from the fact that the true cost of carbon use is not reflected in the final price we pay in the goods and services that rely on it and hence we over allocate resources to those industries. The ETS aims to reduce emissions through price incentives. But as I argue below they are deeply flawed as a result of their rationalist underpinnings. The ETS amounts to nothing more than a privatisation of the commons asset which we call the atmosphere. I cannot believe progressive thinkers (including The Greens) would ever contemplate supporting such an approach. The ETS would create private property relations over public space. For non-economists, the following diagram is the way mainstream economists construct the choice between the two market-based schemes: and ETS and a carbon tax. The diagram assumes that firms will pollute inversely to what it cost them to do so. So the demand for pollution rights is downward sloping with the price of pollution on the vertical axis. If there is no carbon price enforced then it is hard to define the demand curve, so in fact, these sorts of diagrams can only really aim to depict a policy-on situation. The other problem with this sort of analysis is that the macroeconomic pollution demand curve is some composite aggregation for all the individual firm demand curves. There are always problems in creating these aggregations. But as an illustrative device we should not get too worried about this issue. The left-hand panel depicts the carbon tax approach where the government sets the price of carbon emissions per unit and this determines how much pollution is forthcoming (QCT). So the lower carbon tax that is set, the higher the volume of pollution. The aim of the policy is to set the carbon tax at the actual cost to society of the carbon emissions. Accordingly, firms would include the tax in the final price (depending on the ability to tax-shift) and consumers should demand less of the products that are produced by the polluting firms. As a consequence, there would be a change in the composition of final output and QCT would represent the pollution output that mainstream economists would consider to be “efficient” because there would be no external transactions (costs or benefits) that are excluded from the final price of each good and service being supplied. The right-hand panel is the approach taken by an emissions trading scheme (ETS). The government sets the allowable quantity of pollution that firms can emit and then allows the market to set the price of carbon via a permit trading scheme. Clearly, if the Permit quota limit = QCT, then the two schemes will deliver the same outcomes. It should also be obvious that if the government doesn’t allow the market to fully price PETS by providing free permits or exemptions, then even within the logic of the market-based approach you will get market failure. That is, the market outcome will not deliver properly price the true cost of the carbon emissions and the process by which consumers change their demands away from polluting goods and services will be compromised such that there will be “too many” polluting and “too few” clean goods and services. Market efficiency in the mainstream sense can never be achieved under these circumstances. The subsidies that the Australian Government is proposing to hand out (which exceed the revenue it expects to gain from permit sales) basically insulates petrol, electricity demand, coal exports, agriculture and more from the cold winds of reform. So while they claim they are using a market-based system that claim is fraudulent. The design of the proposed ETS actually makes a mockery of the logic of the market-based approach. It is compromised fatally from day one. While I will not go into the history of CTS’s in detail here the experience with them to date has been disastrous. I refer to the European model which introduced a quantity-based (capped) carbon trading system (CTS) with offsets. Phase I was a disaster and more permits were issued than there was pollution and the market collapsed from the excess supply of permits. Phase II of the scheme was fatally compromised by heavy lobbying from large polluters who were able to gain under priced pollution permits. There was also a noted arrogance of the EU which permitted use of about 35 per cent of the global carbon dump while Europe has only about 12 per cent of World’s population. The plan also introduced what was known as the Clean Development Mechanism, which was an offset system allowing polluters in Europe to invest in emissions-reduction infrastructure in poor and developing countries and then use the “offsets” to avoid undertaking more costly emission reductions in Europe. There is ample evidence of the projects having disastrous effects in poor countries and regions. There has been very little technology transfer from the rich to poor countries. The projects undertaken have often brought civic leaders in poor countries into conflict with land-holders with the latter enduring significant reductions in their capacity to feed themselves. Payola is rife! The legitimacy of the $100 billion (£60 billion) carbon-trading market has been called into question after the world’s largest auditor of clean-energy projects was suspended by United Nations inspectors. SGS UK had its accreditation suspended last week after it was unable to prove its staff had properly vetted projects that were then approved for the carbon-trading scheme, or even that they were qualified to do so. It is clear that emissions have not gone down much if at all yet prices of carbon-heavy goods and services have gone up. Yes: profits have gone up among the big polluters. The big winners have been the heavy polluters and the hedge funds (at least prior to the crisis) while the losers have been consumers, the environment, and poor communities. Market-based systems are insensitive to equity issues. The proposed ETS will hand out property rights to big polluters but there is no equity considerations built into this approach which is no surprise because markets are not equitable. It is clear that the CDM has accelerated the exploitation of local subsistence communities in poor countries through dodgy offset schemes. Of significance, and I stressed this point in the Coal Forum last week, markets are insensitive to biological systems. The mainstream economics approach is that you can pay for pollution through more growth. We have to generate wealth before we can clean the place up. I have heard this argument so often. Even Post Keynesians, such as Paul Davidson, continually make this argument. Mainstream resource efficiency is based on the idea of a production possibilities frontier where maximum output is obtained through some optimal mix of inputs (including pollution). The only thing you need to do is make sure the true costs of all resources are reflected in the mix. That is the basis of an ETS. Cap schemes assume there is some known pollution level that is safe. But market systems do not know when a biological system dies – so we need to be more risk averse than economists would recommend. There may be a point – that we certainly cannot predict with any accuracy – beyond which there is no trade-off between pollution and other goods and services. After that point the planet dies. Further, if the science is right major changes are required now. But structural change that are required will require us to leave most of the remaining fossil fuels in the ground. Systems governing transport, community organisation, agriculture, production and more will need to change. The ETS proposed by the Government – which is so compromised that it will, at best, lead to reductions of a few per cent per year are not consistent with the scale and immediacy of the structural changes required. The emphasis on market-based solutions with huge exemptions is also at odds with how Australians are thinking about this issue. The Australian Government’s weak position on this is in contradistinction with evidence released today by the World Wide Views on Global Warming organisation. Here is a link to the Report Summary. 1. 91 per cent of the citizens participating in WWViews find it URGENT to make a global climate deal at COP15. 2. 89 per cent of the citizen participants in WWViews think Annex 1 countries (for example, USA, EU, Japan, Australia) should adopt a short-term target for emission reductions of between 25-40 per cent with 31 per cent saying it should be higher than 40 per cent. These results were very stable across high and low income countries and geography (Africa, Europe, Asia, the Americas). Commit confidently at COP15. Act now to limit warming below 2ºC through a legally binding global agreement. Develop new technology in an ethical and accountable process. The need for leadership, education and technical advances is paramount. The other market-based approach often considered by progressives to be superior to the ETS-approach is the Carbon tax. As the diagram above shows, while the ETS sets the quantity of emissions and lets the price vary, a carbon tax sets the price and lets the quantity vary. But there is no guarantee that there will be a reduction in emissions. Some people (myself included) consider that tax-based approaches are likely to be more successful in reducing emissions because they are less corruptible. Tax system would be less open to special pleading and manipulation. The imposition of a per tonne tax is also more transparent and easily understandable by all parties. Further a carbon tax can be implemented more speedily than an ETS and impacts on all polluters. Cap-and-Trade targets only large firms whereas a carbon tax would also capture small business including farmers. In my view carbon taxes also generate a more predictable price of pollution which, in turn, provides a more certain investment horizon for the private sector. Most importantly, carbon tax systems would not benefit hedge funds, lawyers and consultants, who will make a killing on the ETS should it ever be implemented. 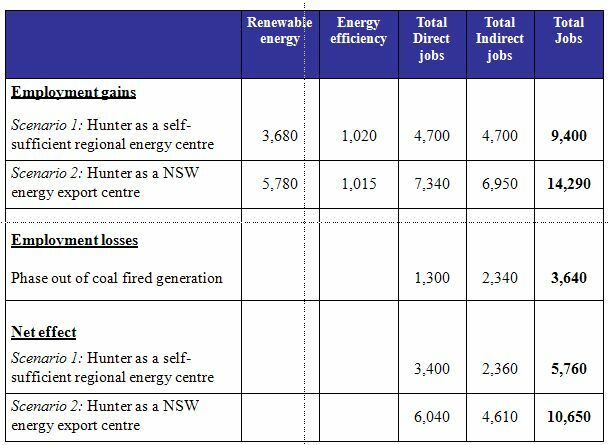 In a major study that we did for Greenpeace A Just Transition to a Renewable Energy Economy in the Hunter Region, Australia, we modelled the employment losses that would result from a closure of the coal-fired powered industry in the Hunter/Wyong region (which is a major supplier of electricity to NSW). We also modelled the total jobs that would be generated by a switch to known and viable renewable energy electricity production techniques and developed some policy parameters to assist the Hunter region in the industrial restructuring from coal-fired power to renewable energy. The conclusion (and if you are interested you might like to read the report in full – it is quite long) was that in making this transition there would be major benefits to region. Shifting from coal-fired power generation to a clean, renewable energy economy would result in a net gain of 5,760 and 10,650 jobs depending on assumptions made about market reach and manufacturing input. The net job creation would result in well-paid jobs in the research, design, manufacture, installation, maintenance and export of energy efficiency and renewable energy technologies. However, in the Report, and I mentioned this in the ABC Radio National coal forum last week, there has to be a Just Transition to ensure that the costs of economic restructuring do not fall on workers in targeted industries and their communities. This will require massive government support and intervention in the form of large research injections to speed up cost effectiveness of renewable energy. There needs to be a serious re-think of the way we develop skills in Australia. The Federal Government has to introduce an integrated employment guarantee/skills development framework to maintain income security and capacity building. On the question of incentives – and I will deal with this also in my upcoming blog on whether you need a manufacturing industry – I do not favour handing out public incentives to private firms. I see this as a denial of “capitalism”. If private firms want the returns then they should take the risk. However, I do support public enterprise and partnerships with local not-for-profit co-operatives. I consider the renewable industry would be ideally placed to develop under this type of organisational structure – more about which later. From a modern monetary theory (MMT) perspective, there is no requirement that the national government raise revenue to fund major restructuring. I also emphasised that we could make immediate changes on the demand side if there was supportive policy structures. There are a myriad of ways that each household could save on energy use. The demand-management efforts in California have certainly reduced the need for new power stations. The problem is that the Government is pre-occupied with the ETS and getting it through Parliament as some sort of trophy that they have let their focus on obvious ways to reduce emissions slip. I explained to the Coal Forum that I would take a rules-based approach in this regard. In this regard, I made the point that I would not provide any further incentives to the coal industry to research clean coal. I would instead impose a sunset condition – industry closure regulation on the industry – say 2030 and if they can come up with a clean coal solution then well and good. If they cannot then they close – totally as a local power input supplier and as an exporter. Meanwhile I would be fast-tracking investment in renewable base load generation capacity as a matter of priority. The article – Coal lobby is not being fair dinkum on carbon reduction scheme – also reports that the coal industry has not invested very much at all in clean coal technology anyway despite their highly misleading advertising campaigns. Accounts filed this week showed so far, out of the coal association’s $1 billion Coal21 fund, the main vehicle for funding clean coal technologies, only $36.4 million has been spent since it was launched in 2006. While issuing the shut-down rule I would also introduce a carbon tax in the meantime to force the industry to more realistically price the cost of production and to fast-track the entry of renewables. The funds raised would not “finance” anything – but reflect another important role of taxation in MMT – to alter the allocation of resources away from “bads”. I completely agree with your criticism of the Greens looking to orthodox economics for answers. The success of the environmental movement hinges on achieving solidarity with the labour movement, yet neoliberalism sets the environment against jobs. If the Greens continue down that path, they will undermine any attempt to form a strong alliance with workers. And workers will be right to be suspicious of the Greens until they drop any connection with neoclassical economics. MMT shows a way forward that can embrace both the interests of workers and the environment. How depressing! The debate in the media is still over whether AGW is real or not, instead of carbon trading vs carbon tax (has any country seriously looked at implementing a carbon tax?). Despite the well documented flaws in the European carbon market and the proposed CPRS there seems to be more awareness about the problem in Europe than Australia where we are still making plans for a world with $20 barrels of oil and no carbon constraints. At least the introduction of a half arsed system might start the ball rolling. Have you bothered to notice that it is getting cooler. Global warming has so been dis-proven only a true believer would not have noted that the global warming scientist have to fudge there numbers and ignore all criticism. Mr. Gore made a billion off his climate exchange last year. He is a good business man. I still don’t know what the heck is going on, but I finally have come to agree it is carbon-caused, and mankind’s’ burning of fossil fuels is not just a small thing in the big wide world, but a Big Deal. Climate change has not been disproven at all other than by selective reading of the evidence by deniers. However neither it is armageddon by Tuesday either. The range of possibilities are still ‘not a lot changes’ to ‘oblivion’ and we don’t know where along this continuum we’ll end up. We’re a clever species and we can engineer solutions to manage a problem outcome (simulating volcanos in the stratosphere for example to induce cooling), however we really need to be focussing on clean energy. For me we should have every available scientist on the planet with as much money as they can eat all focussing on developing nuclear fusion reactors. That is the only we we’ll ever have enough energy to meet global demand. Everything else is really just a stop gap solution. Actually, if every scientist on the planet focused on developing better solar power, batteries, and transmission lines, we’d have a much better chance. There is one good fusion reactor. It’s stored six light-minutes away from Earth and it provides all the energy we’ll ever need. We’re just not using it efficiently. It’s called “the sun”.